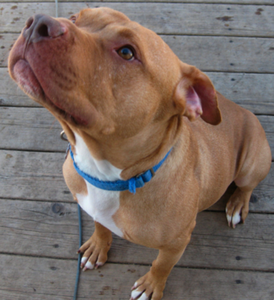 Dogtime’s Road to Rescue program salutes Michigan’s Buster Foundation Pit Bull Education & Rescue. The Buster Foundation Pit Bull Education & Rescue was informally started over a decade ago by Detroit native, Joanie Wazney, who found her calling looking after a number of misunderstood Pit Bull type dogs living in her neighborhood. The non-profit was formed in 2002 and since then Joanie and her band of volunteers have rescued and rehomed nearly 400 bullies in the state of Michigan. The Buster Foundation is a 501c3 non-profit organization dedicated to rescuing and re-homing surrendered and stray Pit Bulls and bully breed mixes. Through decades of cruelty, unethical breeding and irresponsible ownership, a once beloved family dog has now found itself the victim of discrimination and abuse, and a source of misdirected public fear. We believe that every dog is an individual, deserving of a loving home, proper care, and a fair shake, regardless of breed. Through our efforts, we hope to work towards a better educated and more compassionate public. The dogs in our care are a combination of strays, owner surrenders, and shelter rescues. 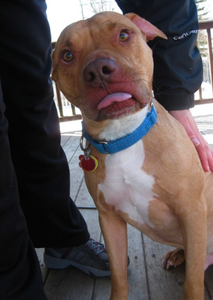 Sadly, the tough economic times that have hit hard in states like Michigan have also taken their toll on Pit Bulls. Because so many people have lost their jobs and/or their homes, and because there are still so many cities, counties and housing rentals that do not allow Pit Bull type dogs, owners are being forced to hand their beloved bullies over to shelters, or even turn them loose on the streets in many cases. People often assume that most rescued Pit Bulls are from dog fighting cases, when in reality they’re usually just victims of discrimination and irresponsible or unprepared owners. We are an all-volunteer and foster home organization, meaning we do not operate any kind of shelter or kennel. All of our dogs are medically examined, temperament tested, spay/neutered, vaccinated, and then placed in one of our foster homes. Our organization is 100% dependent on the availability of safe, responsible, and loving foster homes, especially since oftentimes an adult Pit Bull may take months or years to find a forever home. “Red Jamie” probably has one of the toughest stories you’re ever going to hear. All of our dogs pull at our volunteers’ heartstrings in some way or another, but Jamie’s the dog that makes you smile while trying to hold back the tears. He’s a big 60 lb. teddy bear who will literally wait to go pee if it means spending 5 more seconds next to you. We rescued Jamie in the fall of 2009 after he had spent TWO years in a shelter with no time outside and limited human interaction. After being taken from a negligent owner who went to prison, he arrived an emaciated 36 lbs. at a shelter that did not allow its volunteers and staff to interact with pit bulls. So there Jamie sat . . . alone. Then after one of our volunteers managed to wrangle him out of the shelter last fall, he was placed in a foster home where he had an unexpected tangle with another dog in the house and his face was beat up so badly, he looked like he’d gone 10 rounds in the boxing ring. Currently, Jamie is living in our primary foster home where we house several of our adult dogs, desperately waiting for a person or family who he can call his own to come along and take him home! Jamie might do just fine paired with a nice female dog, but we honestly think this big, fuzzy boy deserves a home and people all to himself. He’s spent most of his life either uncared for, isolated or competing for attention with too many other dogs, and yet all he ever asks for is a big hug from whomever will offer it. The single biggest challenge we face involves both our foster home situation and our adoption potential. Although we have several adult dogs who come to us fully capable of happily living and playing with other dogs, the reality is that many rescued adult Pit Bulls were owned by people who never cared about socializing them with other dogs. And unfortunately this means that we need to find foster homes and adoptive homes who don’t already have other pets, and yet who are willing and responsible enough to adopt a bully breed dog. It’s a challenge quite unique to Pit Bull rescue and one that you don’t often hear about on the various dog rescue shows on tv today. Luckily, just meeting one of our goofy, smiley guys or gals is all that’s needed to melt someone’s heart, even if they never thought about adopting a Pit Bull.